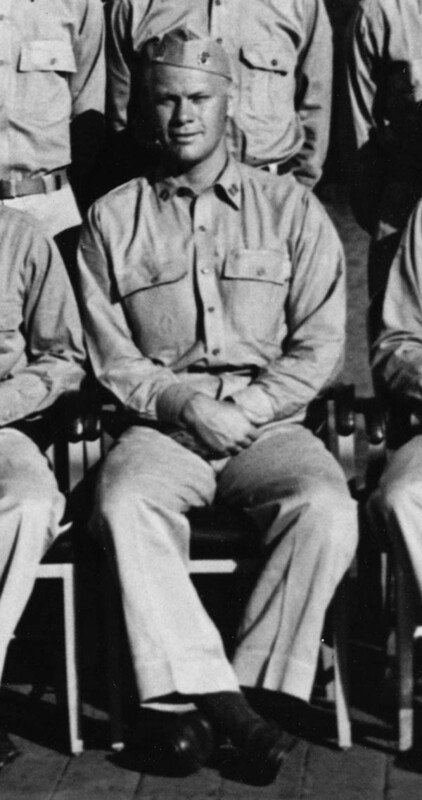 LT Gerald Ford on board USS MONTEREY, October 1943. NHHC photo 80-G-366872. 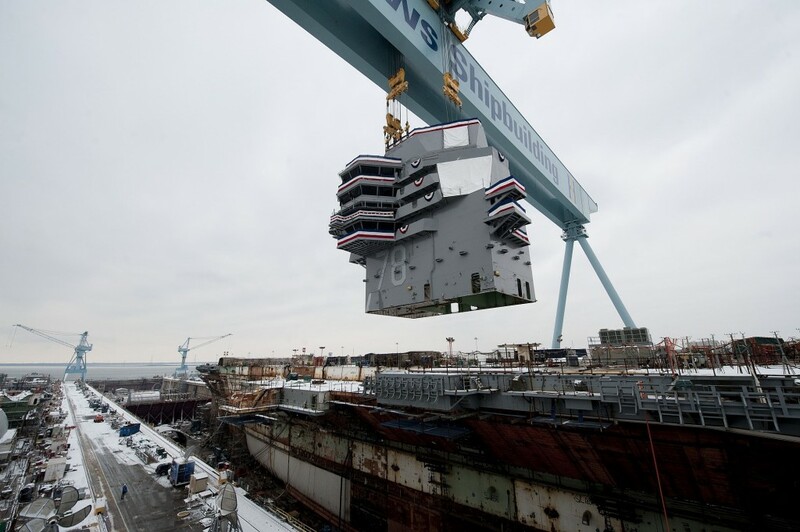 In late January, shipyard workers carefully lifted the 555-ton island on to the flight deck of the Navy’s newest aircraft carrier at Newport News Shipbuilding Company in Virginia, a significant step in the journey towards the ship’s christening later this year (see photo below). 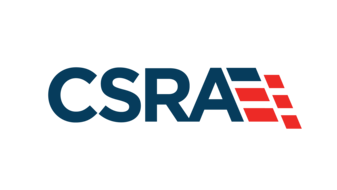 CVN 78, the lead ship of a new class of nuclear-powered aircraft carriers, will be named Gerald R. Ford for the 38th President of the United States. Though he is well known for taking the nation’s leadership role in 1974 in the wake of the Watergate scandal, not many Americans realize that before serving in Congress and as President, Ford was an officer in U.S. Navy during World War II. Ford’s early life was noteworthy for his athletic endeavors at the University of Michigan, where he was a center for the school’s back-to-back national champion football teams in 1932 and 1933. He was named the team’s MVP in 1934, and eventually had his number 48 retired by the university. He graduated from Yale Law School in 1941, and with the outbreak of World War II, was commissioned an ensign in the Naval Reserve in 1942. He initially served as an instructor and sports coach at the Navy Preflight School in Chapel Hill, North Carolina. Given Ford’s reputation as a nationally known football star, it would have been easy for him to safely remain stateside during the war. Instead, he volunteered for sea duty, preferring to go in harm’s way. 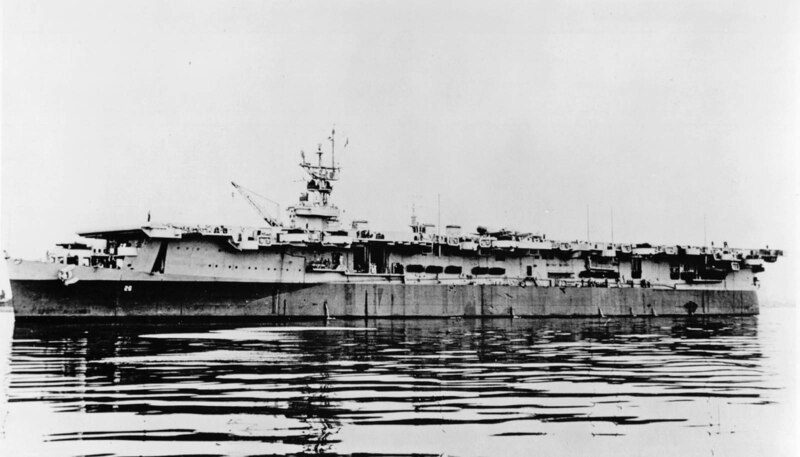 He was assigned to the light aircraft carrier USS Monterey (CVL 26), and was part of the new carrier’s commissioning crew that brought that ship to life in June 1943. The ship arrived in the Pacific theater in late 1943 and supported amphibious landings and strikes against Japanese targets through the remainder of 1943 into 1944. Lieutenant Ford served initially as the ship’s athletic director, as well as a gunnery division officer, supervising a 40mm anti-aircraft gun on the carrier’s fantail. He later moved up to assistant navigator. The ship’s greatest test came at the hands of Mother Nature; on 17-18 December 1944, Monterey was one of many U.S. Navy ships to encounter the massive Typhoon Cobra, a storm that sank three destroyers, damaged countless other ships, and killed hundreds of sailors. On the morning of 18 December 1944, as her rolling exceeded 30 degrees in typhoon-generated winds and seas, Monterey suffered a hangar deck fire as aircraft broke loose, crashed into each other and the ship’s structure, and ignited aviation fuel. Lieutenant Ford headed for his battle station on the bridge where he assumed duties as the General Quarters Officer of the Deck – a position of significant responsibility and authority on a combatant ship in wartime. The situation was dire; directed by Captain Stuart Ingersoll to go below to assess the conflagration, Ford made the dangerous excursion down to the hangar deck and then reported back to the captain. Though the fire killed three sailors and injured nearly forty, and the ship went dead in the water for more than an hour because of smoke being sucked into the engineering spaces through the ventilation system, the crew extinguished the fire and got the ship underway – damaged but operational. USS MONTEREY (CVL 26). NHHC photo NH 67623. While Ford cannot be credited with leading the efforts to save Monterey, his role as part of a combat-proven team demonstrated his courage and steady performance in crisis, a preview of things to come in a long career of public service. As we look forward to the ship joining the fleet in several years, it is important that we remember and salute the bravery and teamwork of a great American in whose honor USS Gerald R. Ford will be named. My uncle, Dale Moore, served aboard the USS Monterey during WW11 in the Pacific. He spoke of the experience with the typhoon Cobra. He was a quite near nunassuming man who loved his naval experience and especially his love affair with naval aircraft in general. His job was as an aircraft machanic. As a hobby, he worked on naval aircraft trainers near St.John, IN. Thank you for sharing that story Kenneth. 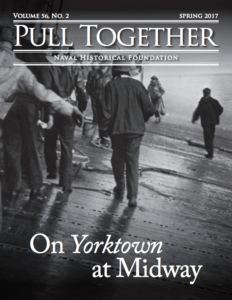 It is hard to imagine the ordeal those men went through during the typhoon, with their ship on fire – such bravery in the face of overwhelming odds. I can back up Kenneth Fritz. Ken is my cousin and Dale Moore was my father. Yes he was on the ship at this time and would talk about this incident. He also would talk about Gerald Ford serving at same time he did. I’m currently doing some research into President Ford’s experiences on the USS Monterey. It would be great to speak to you about your father’s memories of Ford being on the ship at the same time as him. Would you be able to speak in the next week or so? Please email me if you would be happy to talk – emily.canfor-dumas@raw.co.uk. My dad (Frank Nichols) was one of the forty sailors injured during this Typhoon. He was in the engine room when it caught fire. After that he had a great fear of fire (who could blame him), but he said he was honored to have served in the US Navy and when he talked about the ‘Monty’ his eyes always shone and he stood a little taller. He was very proud of Lieutenant Ford when he became Vice President, then President. So to all those who have served or are now serving in the US Navy. THANK YOU. My late father, Thomas Whisler, was the damage control officer on the Monterey during Hurricane Cobra. He never talked much about the events of the storm, nor about his service in general. I wish he had. On 9 November, President Ford’s daughter and ship’s sponsor, Mrs. Susan Ford Bales, broke a bottle of American sparkling wine across the bow of CVN-78 to christen the ship GERALD R. FORD at Newport News Shipbuilding; marking the introduction of the first new class of American aircraft carriers since the NIMITZ was christened 41 years ago. The official party speakers did a good job praising the shipbuilders and the ship’s namesake, with most alluding to Ford’s wartime service in USS MONTEREY. Only one speaker, former Secretary of Defense Donald Rumsfeld, made reference to the now-discredited story of Ford’s role in fighting the fire aboard MONTEREY during the December 1944 typhoon, saying “..at the head of the fire brigade was an unassuming attorney from Grand Rapids….” Rumsfeld had his own personal connection to MONTEREY; as a budding young naval aviator in the mid-1950s, he made his first six carrier landings aboard the ship. My dad,Vincent Verrillo, served on the Monterey during its entire service in WWII. He was a MM1st. He told me many stories about the Monterey and was so proud of “his” ship and how it performed during the war. I actually found him in a photograph taken on the flight deck during a ceremony to King Neptune. He passed away in 2002. My late father GM2nd class B L Saylor Jr served on the Monterey. He was the 40mm gunner on the fantail of the ship which Future Pres Ford was in charge of. My father spoke highly of Pres Ford. He spoke little of the war until after the death of my mother. This is when we learned about his ship board contact with Ford. He talked about some of the battles, one in which he won the Bronze Star. When he talked about the fire during the typhoon, he always said that Pres Ford saved the ship. I’m an Army vet, how would you like to be a (Saylor) in the Navy. My Dad Paul Snow also served on the Monty as gunner or gunners mate. He has told how much he loved the Monty and the brave men he met. Typhoon Cobra, still stay’s with him. He talks about all the men that were lost on that day . He also told me (reluctantly) he was one of injured. His leg was caught some ware near the fire and planes. He was pulled to safety with only a torn up leg. He turns 90 Sunday and we are having a big party for him. I will be telling a story about the Monty..he can’t see anymore( MD ) so i read to him what i have read about the USS MONTY. I am a Veteran of the Vietnam war has we have got older we have talked about our Military day’s .we are a lot closer now. If your dad is still living, get all you can from him in the way of his story in WWII. We are losing all our hero’s of the era, I wish I spoke more about it with my dad. of the Typhoon, and related memories of numerous events that occured aboard ship. He was very proud of his ship, his shipmates and his Naval service. He also spoke highly of Gerald Ford. I served in the Army Security Agency and in some small way better understood Dad’s pride after having done so. Dad passed away in 1993. My father Richard E. LeBlanc served on the Monterey. He was a Private First Class and a gunner on the ship. He spoke about kamikaze pilots, torpedo planes and the smell of bodies in Okinawa. He also spoke about the typhoon but I did not realize how devastating it was. He told me several times about a man swept from the deck by a wave and slammed back on the deck by another. The man lived but had many broken bones. He also spoke about the day the ship returned to New York and how good he felt when he saw the Statue of Liberty as they were heading in. The American Flag on the Monterey was very large, he said they cut the flag in small peices, enough for every sailor to take one home. I have it. I’m so proud. Love you dad! My father passed away on February 11, 1996, the same date the Monterey was decommissioned, and my birthday. My father – in-law, Ford Nichols was a Marine stationed on the Monterey during WWII in the Pacific. He was the captain’s orderly or assistant. Had stories of his duties, taking care of any needs the Captain would have whether it was at his room or on the bridge. He kept a diary of his time onboard and all the places the ship went to and the battles it was engaged in. He also, knew the future President at the time and spoke fondly of him. We lost him 2 years ago at the age of 90. My dad, Edward H. C. Fredericks, a pilot, was on the ship prior, during and after the Typhoon. It was an experience all would never forget, but each did his part without any hesitation or concern for their own personal life and he felt a great kinship to all those served. My dad was fortunate to be able to continue his friendship with Gerald Ford over the years, and was so proud of one of his “JO’s”. Gerald and my mom shared the exact same birthday and fortunately celebrated many years. God Bless to all! My father too served on the Monterey , as a gunners mate under Gearld Fords command. Dad spoke fondly of his realitionshp with Mr Ford. Rest In Peace dad. What a generation we owe a great debt to them. My Step dad – John C Seefried was on the Monterey during Typhoon Cobra. We asked him about it last week and though he can no longer speak, his tearful eyes told it all. I’ll never forget the look on his face as we recounted the stories with him. Thank you very much for your service, sir.